Canon has ended months of speculation by confirming the upcoming launch of the EOS 5D Mark II, a 21.1-million-pixel full frame digital SLR featuring a High Definition (1080x1920 pixel) video mode. Canon has ended months of speculation by confirming the upcoming launch of the EOS 5D Mark II, a 21.1-million-pixel full frame digital SLR featuring a High Definition (1080×1920 pixel) video mode. The 5D Mark II appears to represent a marked improvement over its predecessor. Due out in at the end of November priced £2,299.99 (body only) key differences over the three-year-old 5D include an equivalent ISO range expandable to 50-25,600 and a 3in LCD screen with a 920,000 dot resolution. The revamped model boasts a burst rate of 3.9 frames per second for up to 78 JPEGs or 13 raw files. Photographers can shoot 12 minutes of HD video in HD quality or 24 minutes at lower resolution. The 5D Mark II features a viewfinder with 98% frame coverage and 0.71x magnification. It deploys a Digic 4 image processor, first used on the recently announced 50D. Also on board is Canon?s Integrated Cleaning System, also used on the 50D. Peripheral illumination reduction is possible with adjustments being made according to the type of lens attached to the camera. Details of 40 lenses will come preloaded with the camera. Canon is also set to release a new 24mm f/1.4L II USM lens, featuring UD and aspherical elements and a new lens coating (called Sub Wavelength structure Coating) to help reduce ghosting and flare. We understand that the camera will come with a new battery capable of relaying more detail on its anticipated life by drawing on information such as the number of times it has been charged. The data is relayed to the camera via the battery?s serial number. Canon tells us that the weather-sealing has been improved around the buttons, dials and joins. Canon also claims that the camera is more effective when used at lower temperatures. Also due out is a new Wi-Fi adapter (FWT-E4) which is claimed to operate at distances up to 80m. A new grip (BG-E6), accepting six AA batteries, will be launched alongside the 5D Mark II. 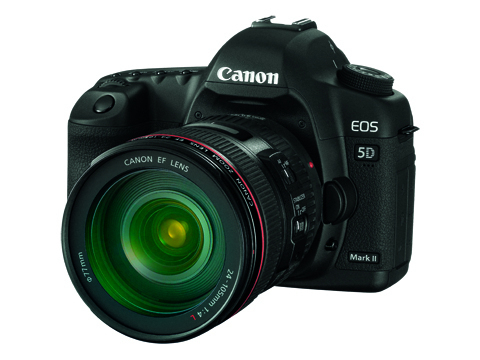 The 5D Mark II will also be available in a kit with a 24-105mm f/4 L IS USM lens, priced £3049.99.